Scotland will need to see off the other Home Nations if Hampden is to be a Euro 2020 venue, says Scottish Football Association chief Stewart Regan. Glasgow will face competition from up to 30 cities, including London, Cardiff and Dublin, to stage matches. "It's highly unlikely that there will be four winning bids from the United Kingdom and Ireland," said Regan. "So our job is to try and convince Uefa that Glasgow is one of the preferred options for that zone, if you like." The SFA will submit a case to host three group games and a round of 16 tie for the 24-team tournament. Uefa's executive committee will meet in September to determine the 13 host cities. "It's not about deserving it," said Regan. "It's about proving you are the right bid at this particular time. Nothing will be handed to Scotland on a plate just because we have a long history of playing football. 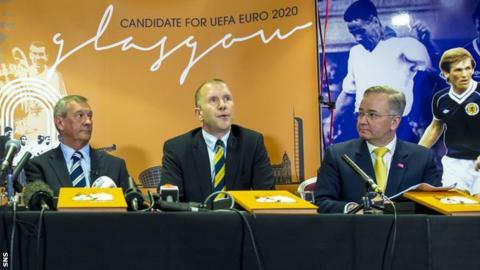 "Our view is that we have got a compelling bid that proves the Scottish FA can put on major events with its partners." With Hampden due to host some events at this year's Commonwealth Games, to add to its role during the 2012 Olympics, Regan says Scotland's bid has a good chance of success. "There is a track record of major-event delivery and there is an infrastructure within Glasgow and Scotland which we believe puts us in a very strong position," he said. Should the bid be successful and Scotland qualify for the competition, two of their group games would be played in Glasgow. There will be no more than one venue per country and host nations will not qualify automatically. The semi-finals and final will be played at one host stadium. "What we are keen to do is showcase football in Scotland being played at the highest levels," added Regan. "There is nothing like major events in your home city to generate excitement amongst the kids. We're really keen to get children interested in the game." Campbell Ogilvie, the SFA president, described the bid document as "first class" and went on to extol the virtues of Hampden Park, which hosted the Champions League final in 2002 and the 2007 Uefa Cup final. "The national stadium has played host to some of the greatest players and greatest games of all-time," he said. "Indeed, Scottish football and Hampden Park are synonymous with excellence on the European stage. "I am sure the whole country - and indeed football fans across Europe - would be thrilled by the prospect of the Hampden Roar providing its unique soundtrack to the European Championships in 2020."